One of the most astounding truths revealed in the Bible is that God is not trying to save all the world now! And yet, conversely, another one of the most encouraging and positive Bible truths is that all mankind shall have a chance for salvation. How can both these teachings be true? If God is not trying to save the World now, how can all humanity have a chance for salvation? The answer to the seeming dilemma is in the Bible doctrine of eternal judgment. What about all the billions of people who lived from Adam till now, who never knew of the name of Jesus Christ, the only name under heaven by which people can be saved (Acts 4:12)? Are they lost forever — doomed to die with no hope for eternal life? What about the idolaters and heathen throughout history? And what about even much-loved members of your own family — now deceased without knowing Jesus Christ, perhaps, or alive but not now religiously minded? What about them? You need to know and be able to explain how you know what good things are in store for all these people. The judgment period for a person is the time of his calling, until death or change into a spirit-composed member of God's Family. It is during this time that a person's life is continually being judged against the biblical standard of righteousness. For different groups of people this judgment will occur at different times — either now (as in the case of God's Church), during the Millennium or after the Millennium in the Great White Throne Judgment. The teachings of the churches of this world are far afield from the clear revelation of the Bible. Most churches do not even understand that all people are not being called to salvation now, let alone understand the connection between the time of one's calling and his period of judgment. The churches usually view the judgment merely as the time of passing of a sentence upon a person. Many people probably picture a courtroom, complete with a fatherly but somewhat stern God in a black robe behind a large desk, faced by fearful, once-living sinners waiting to see if they will go "up" or "down." But such a picture is in no way that presented by the Bible! The astounding, central truth essential to understanding this topic is that God is not trying to save all the world now. Satan is said to be deceiving the whole world (Revelation 12:9). If the whole world is deceived, how can it be in the process of being saved? 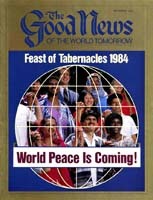 Yes, from the days of Adam and his eviction from the Garden of Eden, through the days when Moses told the children of Israel that "the Lord has not given you a heart to perceive and eyes to see and ears to hear" (Deuteronomy 29:2-4), it has been obvious that God is not now saving the whole world. Paul said, "God hath concluded them all [humanity] in unbelief, that he might [eventually, but not now] have mercy upon all" (Romans 11:32, Authorized Version). No wonder Satan is called the "god of this world" (II Corinthians 4:4, AV) and God's way is called the way only "few" now take (Matthew 7:14). No wonder Paul called the vast majority of humanity "strangers from the covenants of promise, having no hope and without God in the world" (Ephesians 2:11-12). But why? Why has God chosen not to save all people? The answer, simply, is that for God to fulfill His master plan of building righteous, holy character in humans and then to put those humans into His powerful, universe-ruling Family, He must first allow humans to learn that they need God. People will learn that crime against God's law doesn't pay — that life without God leads to war, misery, unhappiness and destruction. Therefore most, but not all, of humanity are being left to themselves now. But, even so, some are being called by God now to preach His message as a witness to the world (not to proselyte or convert the world — Matthew 24:14) and to learn God's way, so they may teach the masses when God finally does call the rest of the human race and open their minds (Revelation 5:10). Two key scriptures in this regard are II Corinthians 6:2 and I Peter 4:17. The first of these is misleading in some translations, which read that God has succored us in "the" day of salvation and that now is "the" day of salvation. But this verse, both in the original Greek and in the Old Testament verse from which it is quoted, does not contain the definite article, but reads that now is "a day of salvation." Obviously, if now is a day of salvation, then there must be other times when God has dealt or will deal with people. The other verse, I Peter 4:17, makes the point that now is only a time of salvation more clear, showing for whom now is the time for salvation: "For the time has come for judgment to begin at the house of God." Notice that a judgment is now on the house of God — the Church of God — but not upon others. And clearly this judgment is not a mere sentencing, but a process of evaluation made by God as He watches over our growth through a period of time. Of course, ultimately, judgment includes God's final decision about our spiritual state, and even the reward if we qualify or the sentence to death if we don't, but to call eternal judgment merely the single moment of decision for God is mistaken. But if now is not the only time when God will call humanity — that is, subject mankind to spiritual judgment for their works, while they know God's law — then when are the other times? The first period of judgment, when most will be deceived and only a few will be called, is now (I Peter 4:17). This era ends with the return of Jesus Christ to set up His Kingdom, and the resurrection to eternal life of all who were called and qualified from Adam's time till then. As Revelation 20:5 says, "This is the first resurrection." It is the time of redemption of the few "called" (Romans 8:28) who form the "firstfruits" (not the whole spiritual harvest — James 1:18, Revelation 14:4) of God's master plan. The second time of judgment is during the Millennium, the 1,000 years immediately after Jesus' return to set up His Kingdom. One clear theme running throughout the Bible is that during the Millennium all then alive will know the truth of God (Isaiah 11:9, Jeremiah 31:34, Joel 2:32). This millennial period of judgment differs from the world now in that all people then alive will have a chance for salvation. But, still, those who lived and died from Adam till Jesus Christ's return and the first resurrection will not yet have had a chance. Their chance will come, however. It is spoken of in Revelation 20:11, which describes the Great White Throne Judgment. This is the time of the second resurrection, when the dead from all time, small and great, will be raised to another physical existence, except this time with a difference. This time the "books" (the Bible) are opened to their understanding (verse 12), and they live out a full life span with the chance to know God and the truth of salvation. This is the time when all the humans who have not had a chance will be given one. This is the time of judgment for Tyre and Sidon, Sodom and Gomorrah, as Jesus revealed (Matthew 11:22, 10:15). It is spoken of in plain terms by the prophet Ezekiel: "Behold, O My people, I will open your graves and cause you to come up... I will put My Spirit in you, and you shall live" (Ezekiel 37:12, 14). Now God's merciful, fair plan will be complete. All will have had a chance for salvation, a period of living during which the truth of God will be open to their minds, and they will be judged according to it — their judgment period. For the Church that period is now. In the Millennium all those then alive will have their chance. Finally, during the Great White Throne Judgment all the former dead who didn't have a chance before will get their opportunity. No one will get a "second chance," but all will get one full opportunity for salvation. Mark 4:11-12 and John 6:44 show that God is not trying to save all the world now. II Corinthians 6:2 explains that now is not the only day of salvation. I Peter 4:17 shows that judgment is a process of time while one is under review by God, and that judgment is now on the Church. Revelation 20:1-12 describes the various resurrections that delineate the various judgment periods. Isaiah 11:9 and Jeremiah 31:34 say that all people will know God in the Millennium, and Ezekiel 37:12-14 illustrates how the former dead will be raised and given the truth of God during the Great White Throne Judgment. Of all the doctrines of the Bible, none show God's boundless fairness any more than the truth about judgment. All people everywhere will receive an equal chance at salvation, and at a time in which their own chance of success will be great indeed. Truly, our loving God is not a respecter of persons, but fair to all humanity!